Matteo Renzi, Italy’s former prime minister, is getting ready to form his own centrist political movement, very much like French president Emmanuel Macron’s La République en Marche. A new centrist group in the UK has also brought excitement, albeit for different reasons. Liberal pro-Europeans are certainly not going down without a fight. But the odds are not looking good for many of them. Liberal democracy is in decline for a reason. Liberal regimes have proved incapable of solving problems that arose directly from liberal policies like tax cuts, fiscal consolidation and deregulation: persistent financial instability and its economic consequences; a rise in insecurity among lower income earners, aggravated by technological change and open immigration policies; and policy co-ordination failures, for example in the crackdown on global tax avoidance. When the financial crisis struck, continental European governments did not take full control of their banking systems, crack down hard enough on bonuses, or impose financial transaction taxes. They did not raise income and corporate taxes to counter-balance cuts in public sector spending. They did not tighten immigration policies. The usual economic statistics do not capture how the lives of people on lower incomes have changed over the last two decades. Stagnating real disposable incomes matter, but so does lower job security and reduced access to credit markets and mortgages. I expect the pushback against liberalism to come in stages. We are in stage one — the Trumpian anti-immigration phase. Immigration carries net economic benefits, especially over the long term. But there are losers from it, too, both actual and imagined. Chancellor Angela Merkel’s decision to open Germany’s borders to 1m refugees in 2015 was justified on ethical grounds, and I am sure will bring long-term benefits. But it turned into a crisis because she did not prepare her country politically. The euro, too, was a liberal fair-weather construction. Once crisis struck, politicians did the minimum they needed to ensure its survival, but they failed to solve the underlying problems, which nowadays express themselves as imbalances that do not self-correct. Without a single safe asset and a genuine banking union, the eurozone will remain prone to financial crises. Liberal democracy has been successful at breaking down trade barriers, protecting human rights and fostering open societies. But the inability to manage the social and economic consequences of such policies has rendered liberal regimes inherently unstable. For now, the right is thriving on the anti-immigration backlash. But its rise is self-limiting for two reasons. First, rightwing policies are not succeeding even on their own narrow terms. A wall along the border with Mexico will not stem US immigration flows any more than the re-nationalisation of immigration policies would in Europe. And second, I suspect that immigration will soon be superseded by other issues — such as the impact of artificial intelligence on middle-class livelihoods; rising levels of poverty; and economic dislocation stemming from climate change. This is a political environment that favours the radical left over the radical right. The right is not interested in poverty and its parties are full of climate-change deniers. Some of the rightwing populists may speak the language of the working classes, but the left is more likely to deliver. The killer policy of the left will be the 70 per cent tax rate proposed by freshman US congresswoman Alexandria Ocasio-Cortez. It is not the number that matters, but the determination to reverse a 30-year trend towards lower taxation of very high incomes and profits. There would be collateral damage from such a policy for sure. But from the perspective of the radical left, collateral damage is a promise, not a threat. What about the radical centre? Mr Macron has demonstrated that grassroots liberalism can succeed as an electoral strategy. But there are factors specific to the French electoral system that favoured Mr Macron’s victory in 2017. And it is too early to pass judgment on whether his actual policies will deliver what his voters wanted. Italy is also a candidate for a Macron-style revolution, but that could not by itself solve the country’s deep-rooted problems. The economic and social impact of liberal policies varies across countries. Germany has so far avoided the downward spiral because of its unique position inside the eurozone and its still relatively strong industrial base. But wait until the irresistible force of the electric self-driving car hits the immovable object of diesel drivers. We have entered an age that will favour radicalism over moderation, and the left over the right. It is not going to be the age of Donald Trump. Is it more similar to the top 1 percent or the working class? The only real winners in today’s economy are at the very top, according to this side of the debate. When Bernie Sanders talks about “the greed of billionaires” or Thomas Piketty writes about capital accumulation, they are making a version of this case. I think the chart above helps to resolve the debate. It shows that both sides have a point — but that it’s a mistake to divide the country into only two groups. To make grand pronouncements about the American economy, you need to talk about three groups. Finally, there is the upper middle class, defined here as the 90th to 99th percentiles of the income distribution (making roughly $120,000 to $425,000 a year after tax). Their income path doesn’t look like that of either the first or second group. It’s not above the line or below it. It’s almost directly on top of it. 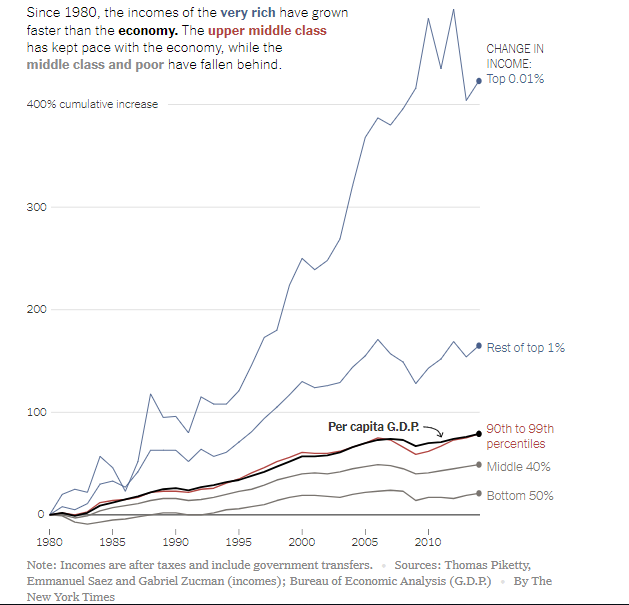 Since 1980, the incomes of the upper middle class have been growing at almost the identical rate as the economy. If you, dear reader, happen to be in this group, I’m not trying to dismiss your economic anxieties. I know that you may not feel rich. You probably have big mortgage payments, rising medical costs and perhaps eye-popping tuition bills. But I’d ask you to spend a minute thinking about how much more challenging life is for the bottom 90 percent. These households aren't making six-figure incomes, and they have received only meager raises over the past few decades. They aren't receiving their fair share of the country's economic growth. No wonder so many feel frustrated. And for too long, the country’s economic policy, even under Democrats, has blurred the distinction between the upper middle class and the actual middle class. In the 2008 campaign, Barack Obama and Hillary Clinton both used $250,000 as the upper limit of the middle class. (Even in the New York area, $250,000 in pre-tax income puts a household in the top 10 percent.) Obama then delivered a tax cut for everyone below that cutoff. In the 2016 campaign, Clinton and Sanders used the same definition. A better approach exists. Politicians should recognize that there are three broad income groups, not just two. The bottom 90 percent of Americans does deserve a tax cut, to lift its stagnant incomes. The top 1 percent deserves a substantial tax increase. The upper middle class deserves neither. Its taxes should remain roughly constant, just as its share of economic output has. So here’s some good news: The 2020 Democratic candidates are moving in this direction. The upper middle class doesn’t deserve the blame for our economic problems. But it doesn’t deserve much government help, either. “Don’t fight the Fed” was a market mantra from another era. If the U.S. central bank was raising interest rates, the stock market would inevitably be fighting an uphill battle. In that case, the better part of valor would be to get out of stocks and other risky assets and take cover in cash. Now, the Federal Reserve and virtually every other central bank on the planet appear to be keenly watching asset prices, given their increasingly tight connection to the real economy. That may not have been their stated intent, but that has been the effect of a marked shift away from restraint this year. The Dow Jones Industrial Average notched its ninth straight weekly advance, for a cumulative gain of 16% over the span, the longest winning streak since May 1995, according to our colleagues at Dow Jones Market Data. The rise has put the blue-chip gauge within just 3% of its record close on Oct. 3. The advance has also been global. The Shanghai Composite Index scored its seventh straight weekly gain, totaling 12.4% during the period. The Nikkei 225 ended its sixth winning week in the past seven and is up nearly 12% from its December low. And the Stoxx Europe 600 had its seventh up week in the past eight, ending up 12.6% from its Dec. 27 low. Minutes of the Jan. 29-30 meeting of the Federal Open Market Committee confirmed that the U.S. central bank was not oblivious to the growing danger to the economy posed by the slide in risky assets. The policy-setting panel confirmed earlier statements attesting to its patience in raising interest rates and flexibility in shrinking its balance sheet, which is another form of policy tightening. While the Fed’s shift so far has only been rhetorical, the effect has been to add $5.1 trillion to the wealth of investors in U.S. stocks since the market’s Christmas Eve low, according to Wilshire Associates’ reckoning. At the same time, the People’s Bank of China has engaged in a number of easing moves. Cornerstone Macro, led by veteran strategist Nancy Lazar, wrote in a client note that the central bank’s actions have boosted shares of U.S. companies with the most sales to China, including A.O. Smith (ticker: AOS), Expeditors International of Washington(EXPD), Boeing(BA), and TransDigm Group (TDG). Reports that U.S. and Chinese trade negotiators are moving toward a deal that would forestall a threatened increase in U.S. tariffs on Chinese goods would clearly be another plus for trade, and continued gains in stock prices. In essence, central banks have tamped down the risk in the markets, which is evidenced by the decline in volatility measures. As a result, the VIX—the so-called equity fear gauge, measuring the volatility of S&P 500 index options—fell for the ninth straight week, to 13.51, less than half its late 2018 peak before it began its slide into somnolence. Nor has that been confined to equities. The MOVE index of Treasury market volatility has also declined by nearly a third since December as expectations of Fed rate hikes have all but disappeared. Indeed, traders continue to bet actively on future rate cuts in the market for options on Eurodollar futures, according to Chicago futures brokers R.J. O’Brien & Associates. The steady rise in stock prices and diminution of risk perceptions make for an opportune time for hot, young companies to make their initial public equity offerings. Last week, Pinterest, the social-media site, submitted a confidential filing to the Securities and Exchange Commission to go public, following ride-sharing company Lyft’s filing in December. Waiting in the wings to go public are other so-called unicorns, notably Uber, the biggest ride-sharing service, and Slack, the messaging service for offices. As with the rush to the debt market noted here last week, the IPO window now seems to be opening. The nonchalance toward risk oddly has as its backdrop any number of potentially market-moving events. Fed Chairman Jerome Powell is due to testify before Congress on policy and the economic outlook, starting with the Senate Banking Committee on Tuesday and the House Financial Services panel on Wednesday. President Donald Trump also heads to Vietnam to meet North Korea Supreme Leader Kim Jong-un during the week. The March 1 deadline to work out a trade deal arrives on Friday but is likely to be extended. Also looming is the expected report from special counsel Robert Mueller III’s investigation on Russian influence on the 2016 election. And in case you’ve forgotten, the March 29 deadline for Brexit also looms. March Madness this year could refer to something other than college basketball, which doesn’t seem priced into the markets. Now that we’re all free to speak our minds (maybe we should we call this the “post-political-caution world”) a lot of previously discredited ideas have re-emerged and are being tossed into the debate – apparently without much thought to, for instance, their horrendous unintended consequences. One such idea that’s, ahem, gaining a lot of currency lately is Modern Monetary Theory (previously known as currency debasement). Another, which seems even easier to dismantle, is open borders. But the emergent democratic socialist movement apparently takes it seriously. (Foreign Policy In Focus) – Supporting freedom of movement isn’t just the right thing to do. It’s a political winner for the left. The slogan “Abolish ICE” — first raised by grassroots migrant justice activists and lifted up by the Democratic Socialists of America — has been brought into official U.S. politics and even carried onto Capitol Hill by Rep. Alexandria Ocasio-Cortez. The slogan has become so potent that the president and vice president have had to go out of their way to denounce it—something Trump did again in the most recent State of the Union. Is there actually a “fundamental human right of movement”? Or is this one of those “it would be nice if” kinds of things that conflict with other “it would be nice” things to present us with trade-offs involving difficult choices. Specifically, giving people from places without social safety nets the “right” to move unimpeded to places with social safety nets could (actually will without doubt) result in massive increases in demand for, and cost of, education, housing and health care for host country taxpayers. Given their high cost and unpredictable timing, are open borders really “a political winner for the left”? This takes us back to our newly wide-open political debate in which everyone’s fever dreams now get equal time. In any large society there are people who believe that invading and subjugating every country that steps out of line is a great idea, that printing unlimited amounts of paper currency increases national wealth, that secret government spying programs make us “more free,” that workers produce all the value inherent in a given product while capital adds zero value (therefore if we just nationalize all the big companies and fire the capitalists…). It goes on and on, because the fringes of society host a near-infinite number of reasonable-sounding but ultimately crazy ideas. A decade ago, most such policies were only discussed seriously in Marxism seminars and militia compounds, for good reason: The average non-ideologue can spot their fatal flaws pretty quickly. But now these ideas’ fans only have to preface them with “in the world’s richest country we ought to be able to…” and the glow of unlimited spendable cash turns ideological sow’s ear into mainstream political silk purse. So open borders could indeed, for a little while, attract some votes. But not for long because the fatal flaw – millions of immigrants swamping public services – will be both easy to explain and hard to defend in debates. And if it open borders somehow survive electoral scrutiny and end up being enacted, the resulting chaos will give the policy a very short lifespan – much shorter than, say, Prohibition. But wait, don’t a lot of libertarians also favor open borders? They do indeed, but with the explicit (maybe even gleeful) understanding that free movement of people from developing to developed world will swamp – and thus end – the latter’s social safety nets, an outcome libertarians like because welfare, Medicaid etc., are not legitimate functions of government. So in this case progressives and libertarians are natural allies only for the first phase of open borders. The other posts in the Really Bad Ideas series are here.